This is a responsive theme, so shrinks to cell phone size. Original request was to enable Tapatalk. I tried. No can do. But - at least you can access the site properly from a cell phone now. 3. Upload picture from cell phone. Well, it's better. The upload limit is 4Mb. So if your cellphone takes 12Mb pictures - I'm sorry, for now you'll have to solve that with some app before uploading. Uploading from my cell phone (HTC Desire) was also confusing. After "Upload" button, I have to navigate to the file system, then Gallery, to find something with the proper ".jpg" extension. But the cell phone first suggests something "ImageMedia", which has file names like "image:89". No idea why. 4. Missing request to join emails. Think I found why request to join emails got lost instead of notifying me. 5. Subscription emails with no content. I tried. I failed. I don't know why these mails refuse to give a teaser of what's changed on the site. Sorry. Well, let me know if anything's horribly broken, as always. But I've had enough fun for one day. 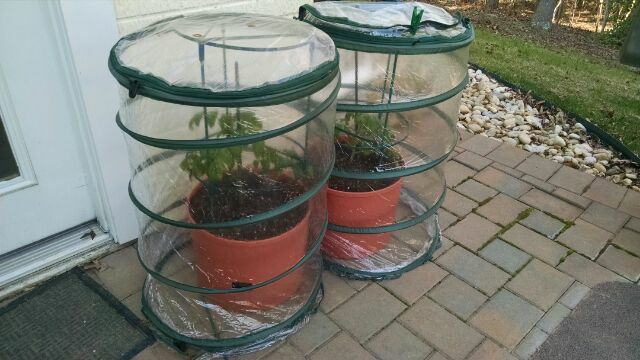 I love your tomatoe cages, Beth! Is that a current photo? What zone are you in? Here the ground finally lost all its snow cover in my backyard after a long long winter. I have small plants growing, but I am afraid I will have to put them on the sunporch for several weeks. I am growing the Boxcar Willy variety this year outside and some Fantastico and DwarfGems inside on the sunporch. I haven't yet planted the latter 2 because I am awaiting a seed delivery. Also..gnats! This year I am using FoxFarm Ocean Forest as a soil and to prevent and counteract the fingus gnat problem that comes with indoor soil growing, am using Beneficial Nematodes and Hypoaspis added to the soil . Have you or Ginger ever had the Gnat problem indoors? Yay, Beth! I hope we see more pictures from you now. And LOL, Corinne - all 3 of us are growing Fantastico! And look at that - I uploaded a picture from my cell phone (via a resize app). Cool!!!! Thanks, DKistner. Making this responsive wasn't so bad... hours, not days. Just used a freely available Drupal theme and beat it into submission where I didn't like it. Subtheming a theme is tricky and effortful... but hours, not days. Heh. We decided a long time ago that we want to see everything newest-first. And we hardly use the Forums here, since most conversations are attached to a Book page, or a Blog, instead of a Forum post. Try the Search box if you're looking for something. And just use "Recent" to find what's new. Does that help any? Having just gone through completely reorganizing my own web site to be responsive, I know how much work this is! Thank you, Ginger. The comments thing is especially important, because I confess I've been completely bewildered about how to get information out of the forums and follow them.